We upstyled the waste hierarchy to give more space to reuse in waste management and in waste policy. Many options can be considered before starting to grind valuable materials. 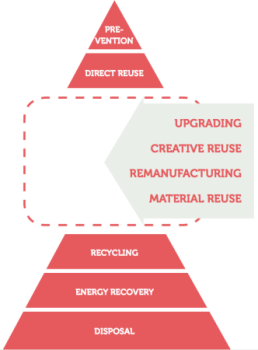 We expand the waste pyramid distinguishing five forms of reuse, based on how much of the original product is reused and for what. This distinction lets us to evaluate alternative options based on their potential to be scaled up and effectively contribute to our economy’s resource efficiency. The Upstyled Waste Pyramid will be featured in our upcoming report about reuse in August 2014. Stay in touch to find out more!